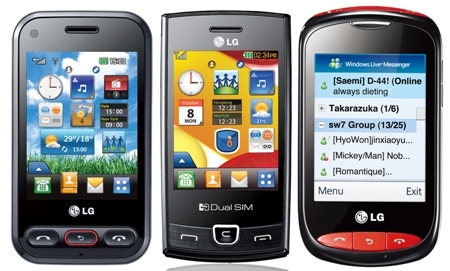 LG Electronics launched three new handsets in the Indian markets. These multimedia centered mobiles are targeted at young users. Designed for social networking addicts, this phone supports widgets for twitter, facebook and even orkut with support for comments and sharing media.There is a 2mp camera at the rear and the best part is the inlcusion of Wi-Fi. With support for video and audio playback and FM, this phone has decent amount of multimedia features. At a price of Rs. 5999, if pushed well, this phone can be the new hot seller for LG. LG has also included comic book reader (Mobi Comix) and music sharing application (zap box) in this phone. This phone sits slightly above T30i in features. While Wi-Fi, 3G video calling are most interesting features, this phone also supports multiple Internet messengers, a highly responsive touchscreen and MobiComix/ZapBox come preinstalled. As per LG, T325 is smooth, fast and memorable. the market price would be around Rs. 6999. Lately, most big brands have started releasing mainstream and mid-range Dual SIM phone and LG P520 is exactly that. Metallic look, 1500mAh (long life) battery, integratoin of strong social networking sites, handful of internet messengers, Opera moblie browser and quality 2mp camera makes this phone very interesting and this phone is priced at Rs. 7399 and is costliest of the lot. All three phones come with inbuilt applications like the Mobi Comix and Zap box enhancing the multimedia capabilities. Speaking of the launch, Mr. Vishal Chopra, Business Head, Mobile Communications, LGEIL remarked: ‘LG offers a unique value proposition. Our products combine aesthetics, cutting-edge technology and remarkable ease of use. Designed with these core values in mind, the new LG T310i , LG T325 and LG P520 give our consumers phones that look great, provide the latest features and more, and are attractively priced.’.